I was flying down the highway when I saw a lump in the left lane ahead. I immediately thought it was a skunk, opossum or a armadillo that did not get across the road. As I got closer I was surprised to see a turtle. He was moving as fast as his little legs could carry him. The other side of the road offered a grassy area with a large pond and he was on the move to get there. He had already crossed one lane of traffic and was halfway across the other. There was a clearing in the traffic and he had a very real possibility of making it. That got me thinking about how many animals make it across the road every day and every night. We see their unfortunate friends and family who don’t make it lying everywhere. Smashed, bloodied and dead they are scattered across highways and even city streets. Little reminders that risk taking can be fatal. A casual drive down the road would make you think a journey across the road is impossible. But this little turtle reminded me that it is not. All this has me thinking about the obstacles in my life that stand between me and my dreams. Sure others have tried to do great things and have failed miserably. That does not mean that it cannot be done. People achieve great things in their work, family, home and personal life everyday. They have marriages that last 50 plus years, children who grow up to follow Jesus, jobs that help their community, and a hundred other little great things. Many of them go unnoticed. Failures make front page news and Facebook posts while success is often done quietly and slowly by those who dare to do great things. I like to think that turtle made it safely across the road. Right now he is swimming in a big pond beside a grassy pasture and enjoying his life. All he had to do was get across that road. Now what is keeping you from enjoying your life and doing something remarkable? This is the season for high school and college graduations, but for my family yesterday was a different type of graduation day. At St. Vincent hospital in Indianapolis the day before a person is discharged from the hospital is called their “Graduation Day.” My dad has moved from ICU to a regular room and then to a room on the rehab floor and now he is coming home today. We are to go pick him up in a couple of hours and after a mountain of paperwork he will get to come home. To recognize his last full day in the hospital they celebrated his graduation day yesterday. I am not sure what all they did but when we walked into his room he had on a camouflage cape with a superman emblem on the back. I also know he was given a “diploma” in his information folder that he appeared proud to have achieved. Being an inquisitive person, I searched around and found two more people on his floor that were celebrating their graduation day too. This experience has me thinking a lot about the concept of “going home.” Dad has had an okay experience in the hospital. The people have been nice and most are very helpful. He has made a few friends in therapy who all call him by his birth name of Freddie. There have been no majorly bad encounters during the last three and a half weeks. But still, it is nothing like being at home. Home is where your family is located. Home is where you are completely comfortable. Home is better than the best a hospital has to offer. I will be honest, I am glad my dad is still with us and has a chance to come back to New Ross Indiana. But I know his real graduation day is coming. Same for my mom. Same for the rest of my family. Same for you. Same for everyone you know. Same for me. There will come a time when we all spend our last day on earth. A day in which we graduate from this life to the next. For those of us who call Jesus our Lord and Savior we will get to go to a home he has prepared for us. Sure it was nice here on earth, but I believe that home will be better than anything we have ever experienced. Sure it will be hard to say goodbye to those we leave behind, but I look forward to all those I will be reunited with in heaven. Sure it will a hard transition, but it will be the best thing that has ever happened to us. Graduation day means the work is over. The journey is done. A new chapter is beginning. Today I look forward to graduation day. This verse has a tension in it that is easy to pass by in a casual reading. In order for us to carry each other’s burdens we must first share our burdens. We have to tell people what we need. We have to open up about our struggles. We have to ask for help. In life I have seen two different ways of people handling this truth. One group is sharing all the time. They are constantly asking for you help physically, financial, spiritually and emotionally. The other group never asks for help. They do everything themselves and quietly carry all their burdens alone. I firmly believe that neither of those groups are right. There are limits to what we share. A person who asks for help all the time is a burden themselves. They drain people while they take and take. On the other hand, never sharing forces you into isolation and resentment as you try to handle everything yourself. My hope is that people will fall somewhere in the middle, or possible bounce back and forth between the two as life moves through good and bed times. The Church wants to be your community of support, but you must share your needs. Share your burdens so that we can help carry your burdens and in this way we fulfill Christ’s will in our lives. 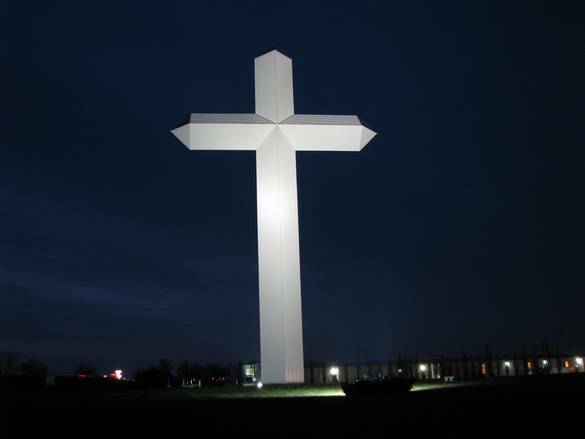 At Effingham, Illinois there is a huge cross that stands beside the road. It has a sign under it that gives the website of www.crossusa.org You an read the whole story there, but I will say that it was built in 2001 and ended up being dedicated a few days after September 11 and the tragedies of that day. It is definitely an interesting sight when traveling down highway 70 in Illinois. The sight of this huge cross did a couple of things for me. First, it stirred some thoughts about the cross. I appreciate that anyone would take the time and money to hold up the cross in the world. Second, I do wonder of the money would have been better spent in other ways. How much mission work could have been with that money? Could a new Church have been started with the money? I am never know about religious monuments like this one. Someone is going to make a mess. It is bound to happen. I do not mean a mess like spilling milk or wearing muddy shoes. I mean they are going to make a mess of their lives. They are going to do the unthinkable, commit some sin and their life will come unraveled publicly. I wonder what your response will be when it happens. 1. Ignore the mess and the mess maker. Act like it didn’t happen. Look the other direction and not get involved. 2. Criticize the mess maker. Tell them they could have done better and how disappointed you are in them. Maybe not say anything to them at all, but rather gossip to neighbors and friends. Tell people how shocked you are and how you could have handled it better. 3. Laugh at the mess maker. Use their failure to make yourself feel better. Run them down as a way to hide your insecurities. 4. Help clean up the mess. Make a call. Offer an encouragement. Drive them. Whatever it takes. When someone spills the milk, the right thing to do is obvious. When someone messes up their lives it somehow gets tougher. The good news is that often I am challenged by reading things I don’t agree with to think differently. Sometimes it causes me to ask questions of myself and my actions. These posts are beneficial even when I don’t agree. This has me thinking about the grid of ideas and questions I use to evaluate the advice I receive. So here are my essential questions about the advice I receive, whether I agree with it or not. 1. Does the Bible say anything about this topic? Is there any direct teaching? Is there any situations or stories that address it? Does the Bible touch on this in any way? 2. Was this article written by a Christian? This helps to understand the authors motives and ideas in writing the article. It can also reveal both positive and negative bias that the author might have in his thinking. I don’t read exclusively Christian material, but I do want to know the authors convictions. 3. Is the author an expert? Some people have earned the right to be heard simply because they have the education and experience. Also I am leery of any advice that comes from unknown places. The follow-up question expands this idea: What field is the author most qualified to speak to? A financial expert does not always give the best parenting advice and counselors do not always give the best financial advice. An expert in one field does not make a person an expert in every field. 4. Do other Christians agree or disagree with what the author is saying? Sometimes even great minds have lapses in their thinking. Take a look at the whole of faith and see what others are saying about a topic. 5. Is my experience similar or different? This is a final question for me and not the first. I have come to realize that what is true in New York, NY is not usually true in Adrian, MO. People are different in all parts of the country and my experience of life might be different. Do I find what is written communicating a common experience or unique? When I finish reading I have the ultimate test of information: What does this material cause me to think, feel or do? Has the article expanded or challenged my thinking? Has it made me feel a new or different way? Has it inspired or instructed me to act? I read a lot of stuff and I realize that there is a lot of bad advice out there, and some of it even comes from well-intentioned people. Often I read or hear something and think, “That is bad advice or wrong thinking,” only to have someone from the Church tell me the same info later. We need to be careful about the voices we listen to from the web. There is so much helpful material if we look in the right places and ask the right questions. So my advice is always to read, listen and learn, but be sure the advice you receive is good Godly advice. Sometimes the little things make a huge difference. Recently I was fishing and a guy who was fishing very near me was catching twice as many fish as me. Upon closer examination I realized he was using a different color jig. I changed and my productivity went up. He was still out fishing me though. So I looked closer and he was using a longer rod with lighter line and this also allowed him to use a little smaller jig. It was a subtle difference that was making a big difference. That simple experience got me thinking about the subtle differences in life. Two families may sit down and eat together every night but one is much closer than the other. That is because one family puts their phones away during dinner. Two families go to Church every week. One has children who are following God and the other does not. That is because one family prays together daily. Two people attend the same Church at the same time every week. One has lots of friends and the other has very few. That is because the one person never asks other people how they are doing. So often it is easy to look at two situations and think they are the same and then marvel about the different results. If you had walked up and saw me fishing beside this guy with the same color jig you might have assumed we would have the same result. Not the case, simply because of some small overlooked details. Maybe to have a better walk with God, a better marriage, deeper relationships, and a host of other things it would be beneficial to look at small subtle things we could change. A prayer, a kind word, holding hands, a day off, a cell phone shut off could make a big difference in your life. Maybe change is found today in the details.